A Little Water And WaaaLahh! 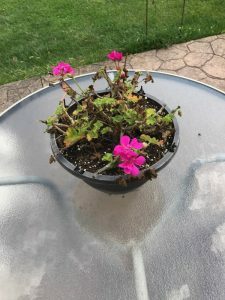 Today I was going out to throw away my geranium out back that had run its course. I was tired of messing with it. I had actually forgot about it and after a few days of no water it had dried up. But when I went out to throw it away today, this is what I saw!! We had rain over the last couple of days and the plant has sprouted new blooms. The bright pink blooms look so pretty against the dead stems on the other part of the plant.! It reminded me of some of my days. I feel tired, dead to the world, frustrated with things and just wanting to throw in the towel. But when I get a little water from the Holy Spirit, I feel refreshed and alive again! It’s amazing what a little watering can do for the soul. Find time each day to read a devotional, study some scripture and ask God what He would like for you to do today. When we spend a little time feeding our soul, God blesses us and our outlook takes on a different perspective – a look with some life in it and maybe even some beautiful bright pink sprouts of hope! This entry was posted in devotional, inspirational, motivational, spiritual on September 15, 2017 by Deanna Young. I’m a day late reading this, but it’s just what I needed early this morning. He knew that!